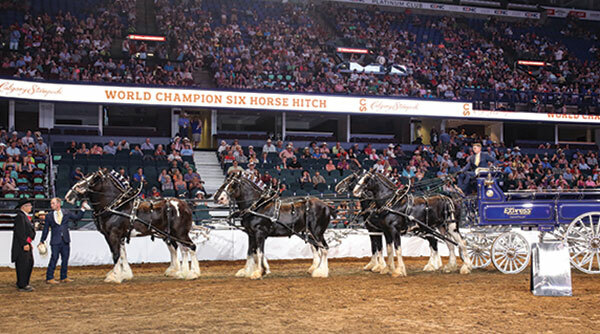 In 2009, 2013 and now 2017, Express Clydesdales of Yukon, Okla., has won Calgary’s prestigious six-horse hitch competition, shown with the live music of the Calgary Philharmonic Orchestra. Owner Bob Funk couldn’t sing the praises of teamster Josh Minshull enough. Calgary has long been a favourite of Minshull’s. One of his highlights with the Express Clydesdale Six was when they chauffeured Prince William and his wife Catherine, the Duchess of Cambridge, at the Calgary Stampede in 2011.